Today’s post has been co-authored by Debbie Szumylo, the Manager, Customer Experience at Thomson Reuters Elite. Follow Debbie on Twitter for a constant stream of great Customer Experience and Customer Service articles: @DebbieSzumylo. 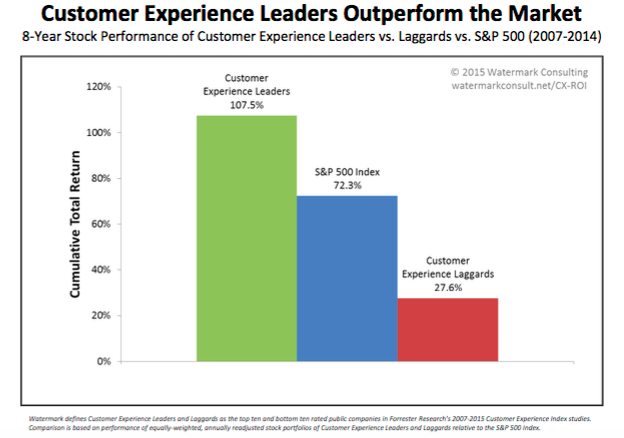 In 2015, Watermark Consulting revisited their landmark study on the stock performance of Customer Experience Leaders and Laggards and in what shouldn’t come as a surprise to anyone, found that CX Leaders continued to significantly outperform the market and CX Laggards. To refresh your memories, a leader was defined as a publicly listed firm in the Top 10 of Forrester Research’s annual Customer Experience Index.  Higher revenues – due to better retention, less price sensitivity, greater wallet share and positive word-of-mouth.  Lower expenses – due to reduced acquisition costs, fewer complaints, and the less intense service requirements of happy, loyal customers. Everyone, from the CEO to the janitor, understands why and how their role affects the way a customer feels about their experience with the company. But, it doesn’t stop there; everyone in the company is a steward of maintaining and nurturing their customers’ experience. Staff who are not supporting a customer directly understand that they are supporting someone who is and treat their internal customers with just as much care. Employees understand that their number one deliverable is to help the customer get something done, regardless of how little or big that task may be. The expectation is that the solution will be achieved in the easiest, most efficient way possible for the customer. Everyone in the company has customer-focused goals they are measured against AND rewarded for. The Voice of the Customer is the input for how EVERY. SINGLE. DECISION. is made. They make sure pure, unadulterated customer delight still has a place. Many experts dismiss the validity of “surprise and delight”; we, however, believe that it still plays a significant role in customer happiness. If a customer leaves, hangs up, logs off, etc., with a smile on their face and their problem solved, you can bet that surprised delight will play a huge role in their ongoing loyalty. Meaningful measurement is baked into every process that touches the customer. Rather than just measuring scores, Leaders follow up quantitative questions with qualitative ones to probe why customers gave the score they did. Leaders constantly ask: “How did we do?”, “How can we do better?”, and “How will we know?”. Regardless of which medium the customer uses to contact a CX Leader, the interaction is seamless, consistent and well-informed. If a customer switches from one channel to another, they do not have to re-enter information or repeat what had already been discussed. Silos are banished. Long gone are the days of various units compiling customer data on their own. A robust CRM tool is implemented and everyone who has even the smallest of interactions with a customer has access to the data. It is important to know that Sally Johnson, a frequent buyer, has two pugs she absolutely adores! Finally, and perhaps most importantly, CX Leaders recognise that the Customer Experience is a function of the Employee Experience – the external experience reflects the internal experience. It is not possible to excel at Customer Experience unless employees are empowered to make the right decisions, understand and feel as if what they do every single day matters and feel valued and indispensable in the ongoing success of the company. Customer Experience Leaders didn’t become CX champions overnight. They started with a customer-centric vision for the company in mind and then ensured that every decision they made was consistent with that vision. Wherever you are along your CX journey, you can always be further forward. Pick one of these nine traits to focus on and keep moving along the path.